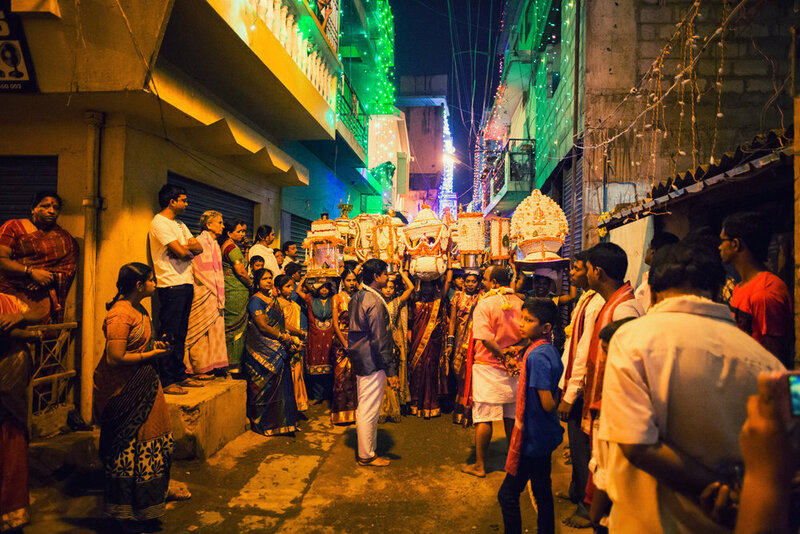 The lasting impression that remains in my mind after having witnessed one of Bangalore’s oldest and biggest festivals is strangely not of visual nature. 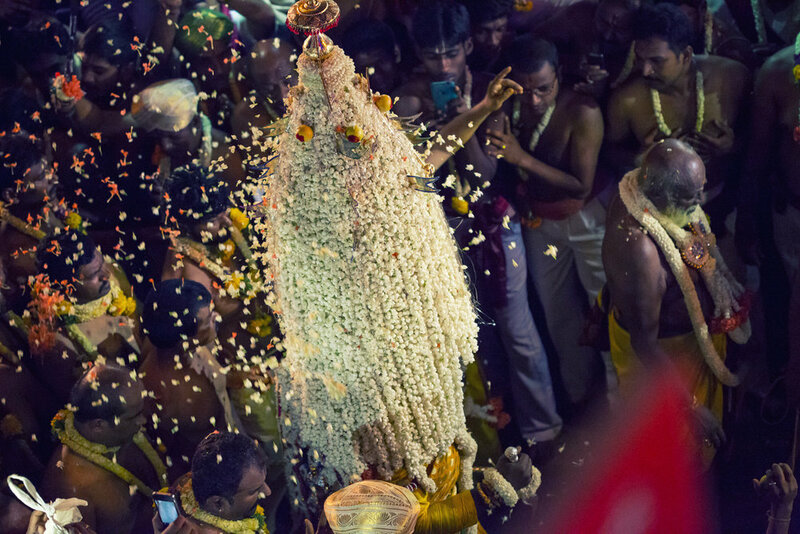 It is of a lingering sound that left a particular hand bell, among the many that heralded the arrival of the Karaga as it passed through the narrow lanes of the Pete. It was neither particularly loud, nor soared above the cacophony that enveloped the procession, but to a keen ear it was certainly distinguishable. ‘Tinn-tak, tinn-tak, tinn-tak’ it resounded in the air, with every alternative ring deliberately dampened to create a distinct rhythm that was persistent and patient. It was a sound that stayed closest to the Karaga, trailing wherever it went, and in a strange way the memory of it brings back an emotion of both excitement and fear. It was for me, the background score of the festival. Ever since I was aware of its existence my reaction was one of sensible evasion. ‘It will be crowded beyond belief.’ ‘It is impossible to coax out a unique perspective.’ ‘Chances are, you will be mugged.’ Yet, well aware that it has been documented extensively and photographed repeatedly every year, I finally heaved myself to witness the Karaga festival and make my own inferences. Fellow photographers, some of whom had proudly covered many editions of it in the past, were generous with their unsolicited advice. One however proved particularly valuable that I later unfailingly followed – go early to stake claim to a spot to photograph from and, stay put. They were of course referring to the pandemonium that unfolds on the pinnacle of the 11-day long festival when swarms of devotees, spectators and eager photographers like me jostle each other, often violently, to catch a glimpse of the ‘Karaga’ – which refers to a male priest in a woman’s attire, balancing a lavish pyramid of jasmine on his head. Another great resource that I was recommended was Professor Smriti Srinivas’ book ‘Landscapes of Urban Memory’, that explores the origins of the festival and the sociocultural aspects the Tigala community interlaced with the history of Bangalore. Although I read it in parts, it is easy to appreciate the profundity with which Srinivas has documented the festival. 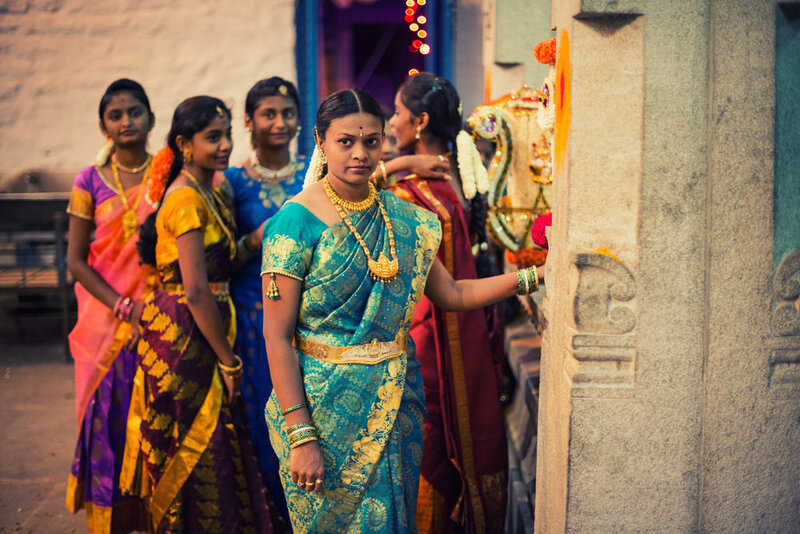 The Karaga is the most important festival of the Tigalas. It usually falls in the summer months of March and April but thankfully, most ceremonies that draw the crowds are held late at night. The Tigalas are traditionally considered expert gardeners and widely acknowledged to have played a significant role in the upkeep of the city’s green cover. Lalbagh is a great example of this, having been commissioned by Hyder Ali himself to develop and maintain the gardens, over two centuries ago. Friend and fellow photographer Dipti Desai, through her photographic project ‘What I owe’, has attempted to pay a visual tribute to the present crop of caretakers at Lalbagh, most of whom still hail from the same community. On the ninth day of the festival, just before the temple square was packed to the gills, I had managed to make my way up a grill-less window on the first floor of a building that gave me sweeping views of the scene below. Bappi from Odisha who works at a gold refining trade housed in the same building, was kind enough to let me in. My prized vantage point was shared with Panneerselvam, who revealed that he is a Catholic working with the Indian Institute of Astrophysics. He had never missed the festival in the last 25 years as if to suggest this was some kind of sport. ‘There is some shakti in the Karaga,’ he confessed, and didn’t think necessary to elucidate further. First published in the Kindle Magazine, Nov 2014.